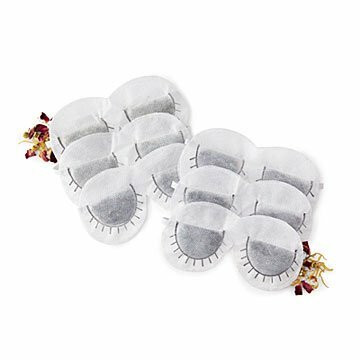 All the soothing tea benefits for tired, puffy peepers, in one stay-put eye mask. If tea were a human, it would be a masseuse, yogi, and best friend all in one. It's so soothing and full of things that make you feel good, we don't just sip it— we put it on tired, puffy peepers, too. The one flaw? Tea bags don't stay put. But that was then, and these masks are now. Steep them like you would a regular tea bag, let them cool (ideally in the fridge or freezer, but at least to room temperature), and settle in for some serious pampering. Pop one in your suitcase or briefcase, or wherever you know you'll want a little "me" time. The set of six includes three blends: black tea and rose, green tea and jasmine and white tea and fennel. Handmade in New York, where eye masks should be given out at every subway station. Steep the mask in warm water, cool in the fridge, wear for 15 minutes. Do not put hot tea bags on eyes or skin. These smell amazing, and they really do work! Just what every girl wants.